The Lady Cyclones are proud to be able to field girls teams at every level. Once teams are formed, the Head Coach and parents make a decision whether to play at the tournament bound or non-tournament bound level. The Lady Cyclones play in the Great Lake Girls Hockey League (GLGHL) which has teams from the Buffalo and Rochester areas. In addition, Girls teams will play in Tournaments in the USA and Canada and possibly play scrimmages against teams in the Syracuse or Albany areas. The Lady Cyclones program offers teams for Girls of all skill levels! 13U to 19U: Girls teams are formed by tryouts in April and compete in GLGHL at the skill level of the team. 9U thru 12U: A supplemental team consisting of Girls from the Webster Empire House program will be formed to provide additional practice time and scrimmage games against other teams in western/central New York. We expect this team to compete at the Girls 12U TB level in the 2019-20 season. Tryouts for 14U, 16U and 19U teams are held in April. The season begins in August with practices with league play beginning in early October and ending in February. 12U team tryouts occur in late March and begin practicing in September with scrimmages from October thru March. 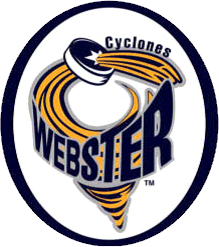 Most practices and home games will occur at Webster Ice Arena. Other Rochester area rinks may be utilized when ice is not available at Webster Ice Arena. Full season Girls teams (14U thru 19U) generally practice twice per week. The 12U Supplemental team will practice approximately once every other week. Opportunities for on ice clinics and off ice training will be available. Girls teams generally play 25 to 40 games between league games, scrimmages and Tournaments depending on age level, team desire and TB/non-TB status. 12U Supplemental Team will play 5 home games with anticipated reciprocal away games. Full season Girls Teams wear the official WYHA Travel Jerseys. Travel jerseys are ordered (for new players and players who have outgrown theirs) in May at a separate cost. Supplemental teams will be issued jerseys which are returned at the end of the season. Tournaments, extra ice time, team events (ex: team parties) and team wear are not included in registration costs. Parents should expect to discuss the locations and costs for these activities at the initial parent meeting with their team's coach. Registration opens in early June and players should register no later than July 31. All discounts and the $150 fee paid at Evals/Tryouts have been already factored into the fees shown. Players who register after July 31 incur a late fee of $50. Players may not participate in any team activities until they have registered and paid. All players are expected to pay in full at registration or sign up for an online payment plan. Parents who wish to pay by check must contact the Registrar at registrar@wyha.com to have a special registration link generated. Family Discount Program: When registering the 2nd/3rd/etc child with WYHA for the 2018-19 season, select the "with Family Discount" pricing option. WYHA checks the registration options selected & bills families if they claim discounts they are not eligible for. $150 Payment at Tryouts NOTE: All fees in this registration assume $150 was paid at Tryouts or Evals. Players who did not pay this fee by May 31 should the check option "I have not paid the $150" and $150 will be added to their fee..
Use the Registration below to register those players who were selected for a WYHA Girls Team (other Programs have separate registrations).